Olga Marie Caten Baxter, 83, passed away on Aug. 1, 2018, in Pensacola, Fla., after a brief illness. She was born on May 22, 1935, in Millry, Ala., to Esra Lee (Ford) and Preston Caten. Known as “Marie” to family and friends, she grew up in Deer Park, Ala., and graduated from Fruitdale High School in 1953. She then went to work for civil service in the libraries at Brookley AFB in Mobile, Ala., and at Pensacola NAS, retiring after 33 years. 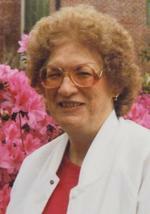 Marie enjoyed playing bunco and bingo, and was a regular at Zelica Grotto Hall bingo for many years. She loved watching “The Godfather” movies, listening to Elvis’ gospel music and reading John Grisham novels. At holidays, she was known for her Easter Bunny cake and fruitcake cookies. She had a “soft spot” for animals, and the family dogs always knew who doled out the treats. One of the highlights of her retirement was a trip to England in 1992 in which she saw Queen Elizabeth II and Princess Diana in the “Trooping the Colour” parade. She was preceded in death by her husband, Ellis Baxter; her sister, Bettie Weldy Smith; and stepbrother, Warren Weldy. She is survived by her daughter, Sheri, of Dallas, Texas; two nephews, Chuck Smith of Foley, Ala., and Craig Smith of Grand Bay, Ala.; and a niece, Cathy Smith of Wilmer, Ala.
Memorial donations may be made to West Florida Public Library or the Humane Society of Pensacola. Condolences may be made to trahanfamilyfuneralhome.com. To send flowers to the family of Olga Marie Caten Baxter, please visit our Heartfelt Sympathies Store.